One of the best places in central Texas to get in the holiday spirit is Gruene, an historic section of New Braunfels about an hour’s drive from Austin. If you’re looking for some authentic Texas cheer, Gruene Historic District offers live music every day, specialty shopping, unique venues for dining and festive events suitable for both the young and the young at heart. Most music shows are free Monday through Thursday evenings and Saturday and Sunday afternoons. Friday and Saturday evenings are generally ticketed or cover shows. For band schedule and availability, call (830) 606-1601. 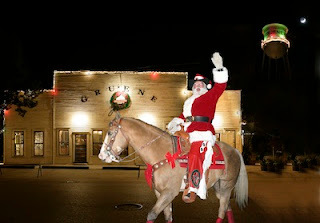 On Dec. 14-15 and 21-22 bring the kids for photos with Cowboy Kringle, Gruene's own brand of Santa. Pictures will be taken in the breezeway between The Grapevine and Gruene General Store Stay for live music at The Grapevine from 3-6 p.m. featuring Bo Porter duo on Friday and Bret Graham on Saturday. Jerry Jeff Walker is the scheduled headliner at Gruene Hall on Saturday, December 14, with The Kelly Willis and Bruc Robison Holiday Shindig promising to attract many visitors on December 20. Join the fun at Two Ton Tuesday Christmas Show, December 17, when Two Tons of Steel, one of the state’s musical treasures, will rock a country music show at Gruene Hall. On December 19, Come and Taste It, the regular third Thursday wine and brew tasting, will feature local winemakers and brew masters on the patio and garden of The Grapevine. 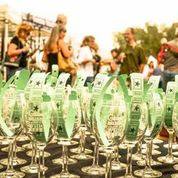 This is a great opportunity to learn directly from the craftsmen, engage with other visitors interested in wine and beer, and enjoy the natural surroundings of Gruene Historic District. Samples of food that is offered for sale will be provided, and each event features live music and prize giveaways. For more information, visit GrapevineInGruene.com or call (830) 606-0093. Special music at Gruene Hall during the holidays includes: Reckless Kelly, Dec 21; Cory Morrow, Dec 27; Roger Creager, Dec 28; and Casey Donahew Band, Dec 29. Kevin Fowler returns to help ring in the New Year at Texas’ Oldest Dance Hall on Dec 31. Advance tickets are recommended. Free live shows will be offered all day on New Year's Day. For details, call (830) 629-5077 or visit HolidaysInGruene.com.